Is high speed internet available (probably not but have to ask)? How expensive would it be to feed a family of 4 each month? What type of winter clothes are recommended? I have an infant, how difficult to get diapers? I will try to answer some of your questions with some general information gleaned from the Interwebs, but I'm sure there are others who can provide firsthand knowledge. Some of these are general enough that generic advice for anyone living in rural Alaska should suffice. Others would require knowledge of Quinhagak itself. LKSD has a pretty responsive HR department, and I am sure could answer the site-specific ones if you contacted them. LKSD's HR department has a handy guide created in 2014 for newly hired teachers which may be helpful for several of your questions, although it does not specifically address the running water one by site. Although it is not possible for me to know for sure if the teacher housing has running water, it seems that it may. Most school district teacher housing in most districts in 2018 have running water. However, not all units in every Alaska school district do. School buildings do have water. It is common for village schools to provide water and/or laundry facilities to staff in villages where the community itself may not have running water. This may be in the form of distributed water by an above ground, insulated piping system just for the teacher housing units near the school, or it can be sometimes distributed by truck from the school to holding tanks at the teacher housing units. In a few teacher housing units in a few districts, though, teachers may need to "pack water", or haul it from a local water source themselves. In villages where teachers do not have plumbed water supplies to their housing units, they are usually welcome to use shared shower and laundry facilities at a school or other district owned building in that village. LKSD's website template for each school has an area for locally-relevant information, and some of the schools have details about the teacher housing units. 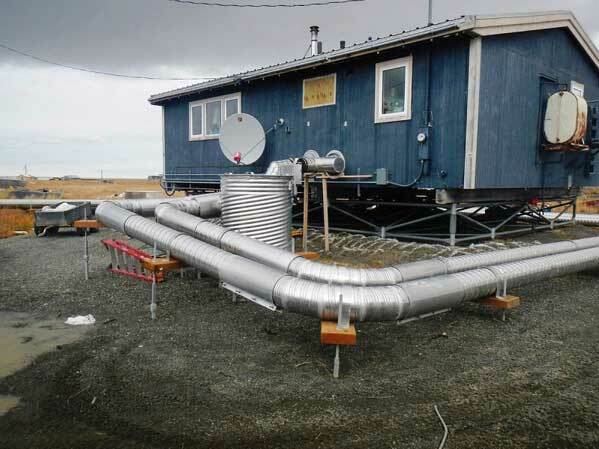 Kasigluk, for instance, has a picture and details about plumbing for each unit. I did see that in 2012, LKSD received a $1.2 million grant from the Alaska Housing Finance Corporation to improve teacher housing units in Quinhagak. Many school districts have using AHFC incentives to improve the quality of teacher housing since the program started in 2007. The primary focus of the AHFC Teacher, Health and Public Safety Professionals program has been to provide a source of grant funds that will help pay for the development of decent, safe, and affordable rental housing for teacher, health professionals, and public safety officials. In addition, it appears that the community of Quinhagak does indeed have water and sewer services constructed at a cost of about $40 million by CRW Engineering. In every village I have been to where the community does have water and sewer, the teacher housing all does as well. So, although I can't be 100% sure, I would put a one dollar bet on Quinhagak having teacher housing with running water and sewer services. This is easy, as all villages with schools and/or teacher housing have electricity. There is usually a diesel generator that supplies each community, and is maintained by a local electric company. Some villages also have shared power generation arrangements with a school district, and school properties may have their own backup generation infrastructure. Well, the definition of "high speed" is going to be elusive. Is there Internet available in rural Alaska? Yes, things have really progressed over the last ten years. Many villages now have a fiber connection through GCI or another ISP, and teachers can subscribe to their broadband plans. Here is a post I did in 2015 that outlines how to find if GCI's Terra project supplies a village, and some sample pricing from that year. Quinhagak is listed as connected on Terra. Now, the speeds may not be 100% of what you are used to in a "high speed" or "broadband" system in the Lower 48, and there will likely be caps on how much bandwidth you can consume per month, but it will work with streaming and basic Internet. You will not be isolated. 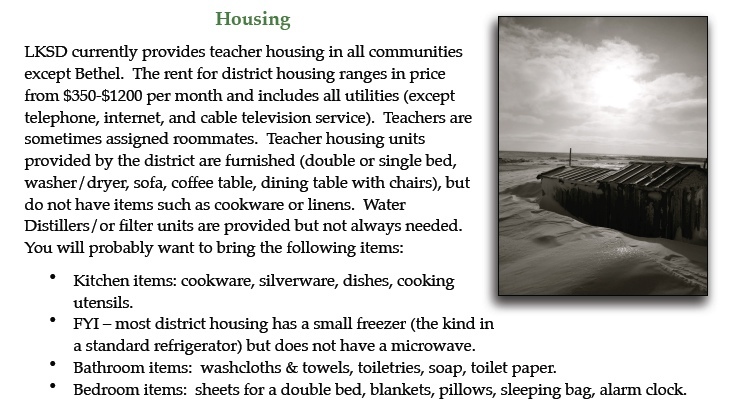 It is important to note that most teacher housing with utilities included does not include Internet. Teachers do have to typically pay for their own connection. The page above has tips about this. In general, most recommend you wait until you get to your school and ask existing staff what they use, and see if there is any available from departing staff. When you arrive in August you will only need a basic "fall" wardrobe like polypro sweaters, a rain / wind shell, waterproof boots, glove liners...and possibly some rubber boots. See the shopping tips page for more info, or search this form using the search box. If you are referring to disposable diapers, the answer is "Amazon Prime is Your Friend". You can get them shipped by US Mail (with advance planning) at the same cost as you would pay anywhere in the Lower 48. However, if you run out, local store options are likely to be quite expensive. I would order your first batch before you depart for the village, and address it to yourself at the school (your district may have specific preferences / instructions about this) to make sure you have some upon arrival. Hope this helps, but others will likely have more specific first-hand information about Quinhagak or LKSD. Thank you for the detailed post! VERY helpful.